A piano model that works well for rehearsals, practicing and creating piano music in a home setting for beginners! 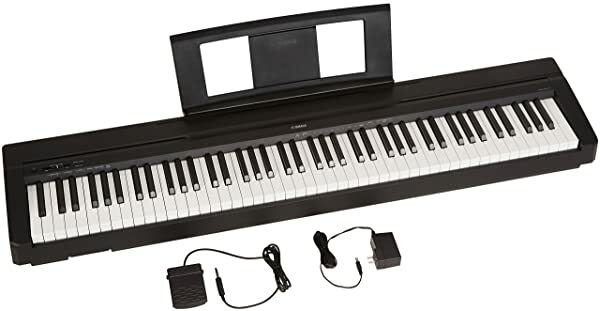 This digital piano by Yamaha is one of the best options for beginners who wish to have a piano for practicing and learning within a specific budget. As this piano belongs to premium quality brand Yamaha, thus a buyer can be sure that he is spending money for a good quality product that would last long. Yamaha P71 is available with all the amazing features for a beginner player. You can enjoy complete realistic sound effects and playability with this instrument. For those who wish to learn, practice and progress as a pro pianist, this exclusive piano model could be one of the premium choices for them. Build Quality & Design: This product has an elegant yet simple design and one of the major benefits of this piano is its modest footprint that makes it easy to fit in any place around your home or studio setting. Yamaha is a brand itself known for designing exclusive pianos and this piano is no exception. The design is so compact that the depth of this piano is less than 12 inches. This slim and stylish piano weighs only around 25 pounds thus you can easily carry it around. Keyboard: This piano features a full 88 keys weighted keyboard that enables pianists to experience authentic piano playing experience. So whether you are a classic expert player or are a keyboard beginner, you will be able to appreciate weighted keys of this piano. Your fingers will feel much stronger over this keyboard and you will be able to enjoy more expressive playing styles. Sound Sampling: Professional digital sound sampling is accustomed with this piano that gives you a sound similar to a grand piano sound. Realism and professionalism with sound quality and a variety of 10 different voices with this instrument gives you a chance to test your creativity. Tones are sampled directly from Yamaha acoustic grand pianos so that you can chance and play sound in a variety of ways simulating sound effects similar to those pianos. Dual Mode: With dual mode feature that could be termed in relation with digital sampling, this piano allows you to combine two different instruments and play them together at a time. For example if you select piano and strings, you get to play piano through the half left and strings through the half right side of the piano. This digital piano has a variety of instruments and synthesizers included in it which a pianist can combine to experiment and add variety to his performance. With the use of this feature, you get a richer and deeper sound with your digital piano. Recording Feature: Another advantage that even allows you to create a duet with your own self is the recording feature. You can record your practice and performance sessions with this piano and play them over again as and when needed. Controls: This piano is popular among beginners for its simple volume and function controls. Even a first time piano player will be able to easily begin playing this piano because of its ease of use and simple controls. USB connectivity: Yamaha P71 features a USB port with the aid of which a pianist can connect this instrument directly to a computer system and thus can transfer his practice and performance samples easily. Headphones: You can even enjoy practicing, learning and performing alone at any time during day or night without the fear of disturbing others with its headphones connectivity option. Accessories Included: This product comes with a power adaptor, sustain pedal and sheet holder. With this complete package of digital piano, a pianist can start right away with more complex and advanced pieces of music. Realistic sound and playability experience is offered with this exclusive beginner level digital piano. Fully weighted keys that enable beginners to gain proper piano playing technique. It has a sleek and stylish design and it is really light weight thus making it easier to carry around for practice and performances. Digital sound sampling from grand pianos and other instruments make way for impressive sound creativity. With its dual mode, a pianist can play different sounds and styles at a time to make piano music much richer. Perfect choice for beginners in terms of its simple functions, ease of playing. This piano is not completely realistic and thus may not be suitable for professional performers. Features and sounds are only limited so an advanced piano player would have limited capacity of playing according to his capabilities. This piano doesn’t come with an LED screen thus limiting you from ease of customization of effects and voices in use. The Yamaha P71 could be a good option if you want a good quality piano for beginning to learn and practice piano and you do not want to spend a fortune of money for your initial level instrument. With its high quality construction and reasonable sound features, you can learn and grow yourself as a pianist while practicing at home. Its full sized keyboard, digital sound sampling and other related features give you a feel of playing real piano that makes playing piano music more interesting for a pianist. Not only features but its stylish compact design makes it a piece that proves itself as a good choice for all the aspiring pianists.